In addition to family, football, and fancy side dishes you’ll never see for another year, Thanksgiving brings an annual dilemma to the oenophile. What wine to serve for Thanksgiving is a tricky question, as the holiday table replete with savory and sweet options is an Ellis Island of tastes, making for a tough wine pairing. This year, instead of hoping to get it just right, I’ll be serving a wine that has the best aspects of Thanksgiving (family, friends, socializing) built right into the product. 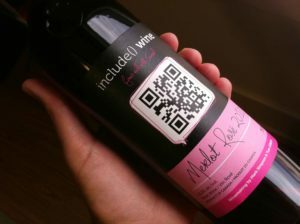 include() may indeed be the world’s most social wine. Designed from the ground up to converge social media (the newest of the new) and wine making (the oldest of the old) into one package, include() is an interesting example of crowd sourcing and modern marketing sensibilities. Conceived in July, 2010 by Brad Marshall (a partner in digital agency Artistech), include() currently offers a Merlot Rose and Bordeaux style red blend. The company itself is a joint venture between Artistech (Kelowna, British Columbia) and beverage consultancy Artisan Group (Vancouver). I’ve owned and operated several digital agencies, but I never thought to start a wine-making business. Damn! According to Brad, even the name of the brand has geeky/social roots. One evening I was reading some HTML source code and “include” jumped out at me. It was friendly, thoughtful and inviting. Just what we were looking for. We kept the brackets to keep our geek credibility. Bottles of include () also feature a prominent QR code that when scanned takes your smart phone toting self to a nicely formatted mobile website with lots of background information on the brand, plus introductory video and an order form. I’m mixed on QR code usage overall, but sitting around a table for a while staring at a wine bottle seems like a pretty solid occasion for taking the time to scan. 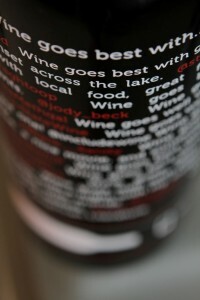 They also promote the website and SMS program on the bottle, which is wise. Speaking of video, include () does a nice job demystifying the process, with several good clips from head winemaker Mark Simpson. Videos on Facebook also contain embedded “like” buttons. We spend a lot of time as social marketers thinking of ways to get customers to interact socially with products. include() backs it up a step and builds sociability into the product and its marketing from the outset. Interesting. I can report that include() is pretty darn tasty. I spent a week in the Okanagan Valley in Canada a couple summers ago, and enjoy the wines from that region quite a bit. Alas, import/export rules vary widely in the wine business, so whether you can buy include() online for your own enjoyment will depend on your location. Check their excellent website for info.